Delphi is a town in Greece. It is a World Heritage Site. It has an archaeological site related to the Oracle of Delphi. 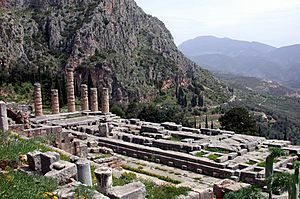 The Pythian Games were held in Delphi. Among Delphi's art treasures is the Charioteer of Delphi. Site plan of the Sanctuary of Apollo, Delphi. The reconstructed Treasury of Athens, built to commemorate their victory at the Battle of Marathon. View of the Athenian Treasury; the Stoa of the Athenians on the Right. 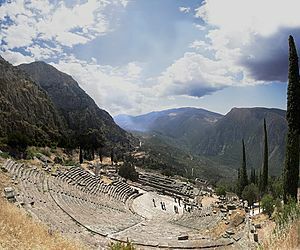 The theatre at Delphi (as viewed near the top seats). The Tholos at the base of Mount Parnassus: 3 of 20 Doric columns. Athena Pronaia Sanctuary at Delphi. The mountain-top stadium at Delphi, far above the temples/theater below. Section of polygonal wall at Delphi, behind a pillar from the Athenian Stoa. Delphi, Greece Facts for Kids. Kiddle Encyclopedia.